For the second year in a row, Chicago's GREAT LAKES TATTOO transforms and challenges the “tattoo convention” status quo with their highly-lauded Walk Up Classic. A two-day event, the Walk Up Classic features 22 artists from all over North America tattooing designs from flash sheets created specifically for the event, as well as last year’s Walk Up Classic designs and from the extensive collection on the walls at Great Lakes Tattoo, making this a unique and important affair for tattoo collectors and casual fans alike. Last year, the artists were able to complete over 200 tattoos in two days and this year, they will undoubtedly surpass that. Between the hours of 11am and 7pm on Saturday and Sunday March 18th and 19th, clients will be able to walk in and select designs to be tattooed the same day - no month-long waiting lists or multiple sittings, no attitudes or egos, just efficient and reliable tattooing in a relaxed and enjoyable atmosphere - by some of the greatest tattooers in the country. The artists are available on a first come, first served basis so arriving early is advised. Additionally, GLT will host an opening party and flash preview the evening of March 17th where clients can choose from designs prepared by all participating artists exclusively for the Walk Up Classic. 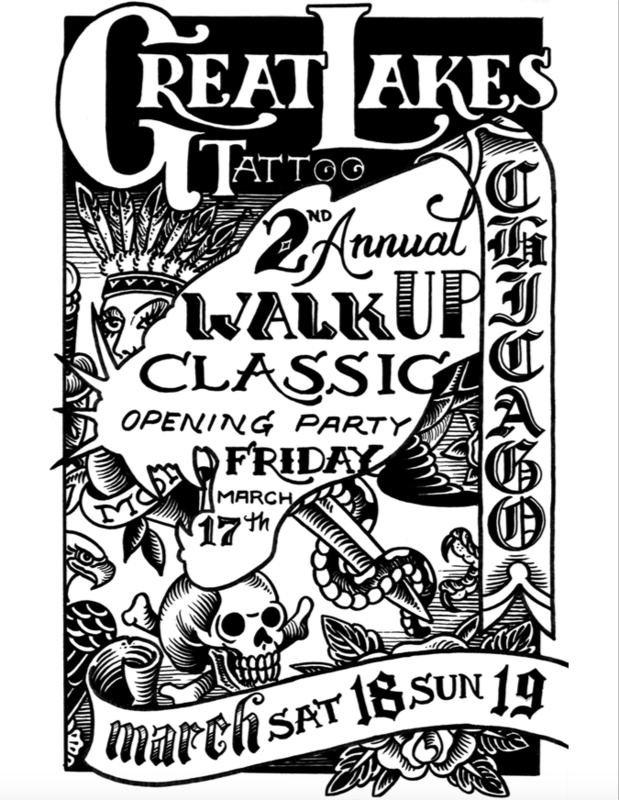 GLT’s Walk-Up Classic is sponsored by Jet Black Supply, Lucky Supply, Old Standard Supply, Time Tells Pigment & Trendy Tattoo Supply. Additional sponsors include Dark Matter Coffee, Letherbee Distillers, Nixon, Mindy’s Hot Chocolate, Revolution Brewing, and Virtue Cider. * poster artwork by Scott Sylvia.